I am a huge potato lover! Anyway you can make a potato I love it, and my love is shared by the rest of the family as well. We all talk about what would taste good in a potato dish. We even have some ideas for sweet potatoes. But regular old Idaho spuds are the go to ‘taters for this house. Another thing we love is roasted garlic. I mean that stuff is seriously like candy! I could roast a head and just eat it as is. So it only seemed logical to put two of our favorite things together. potatoes, roasted garlic, butter, chives….yup it all sounded good. But I didn’t want to add sour cream (as usual) I wanted something that would make the potatoes creamy and richer without the “tang” of the sour cream. The roasted garlic should be able to shine though (in my opinion). Then a friend suggested mascarpone cheese. She had seen a bit on Food Network with Bobby Flay and he added it to his potatoes. Yummm I love mascarpone cheese! It is kind of like cream cheese but a bit milder in flavor. I felt I had found the missing piece to my mashed potato masterpiece. I was correct! These potatoes were so creamy yet the garlic made them a bit sweet. 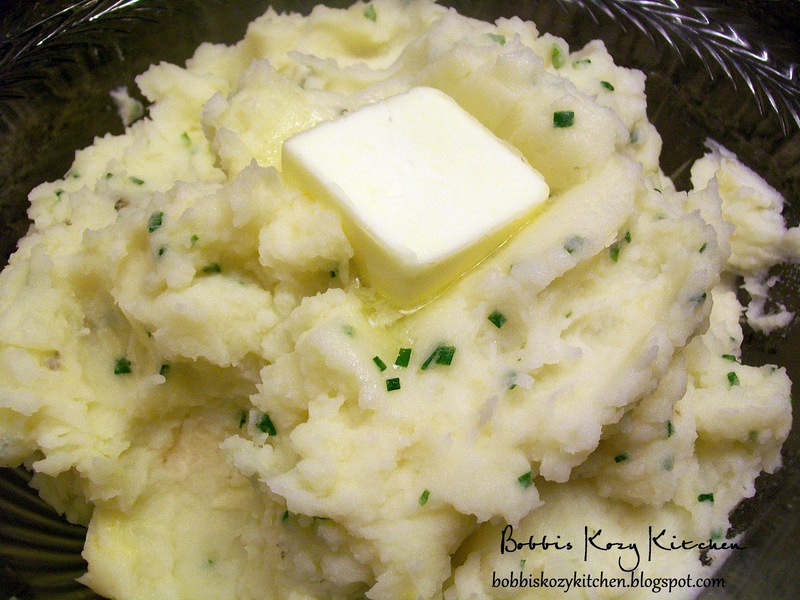 I don’t know if I will ever make plain old mashed potatoes again! !